In this article, we'll analyze the steps needed to create a report in your Salesforce account and display it on Geckoboard using our Salesforce integration. We cover the basics of using the Salesforce integration in this article. Here, we’ll focus on creating reports within Salesforce. Which version of Salesforce are you using? This article walks you through building a report using Lightning Experience. Click the Salesforce Classic tab below for instructions on how to create a report in Classic mode. For this article, we'll be using the report criteria of Closed Won opportunities in the Last FY grouped by Opportunity Owner. Click the Reports tab on the navigation bar. In the Choose Report Type list, type Opportunities in the search field, and then select Opportunities from the list that appears. To begin selecting the scope of the report using the standard filters, click the Filters pane. Click Opportunity Status to bring up the edit filter window. From the drop-down menu, select Closed Won, then click Apply. Click Close date to bring up the edit filter window. From the Range drop-down menu, select Current FY, then click Apply. You might find the previewed report contains columns you don’t need for this report. If so, you can remove and rearrange the ones you do need to make better sense of the data. Click the Outline pane to show columns/fields. Click the close X next to the following fields: Type, Lead source, Next step, Fiscal period, #Age, Created data, Owner role. Click the arrow next to Fields to Show all Fields. Search for the Stage Duration field and drag it into the Outline panel and drop it right below the Stage column. 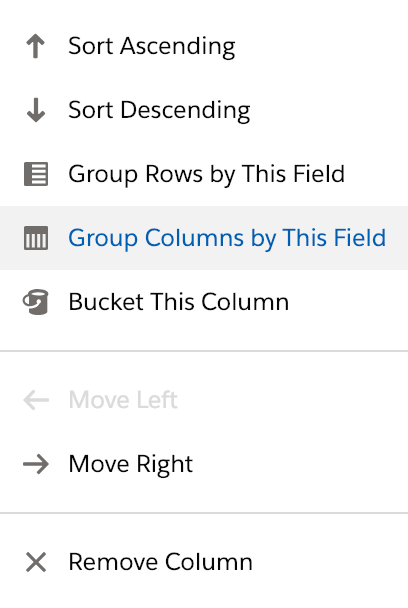 To select the grouping, click the down arrow by the Opportunity Owner column heading and select Group Rows by this Field. 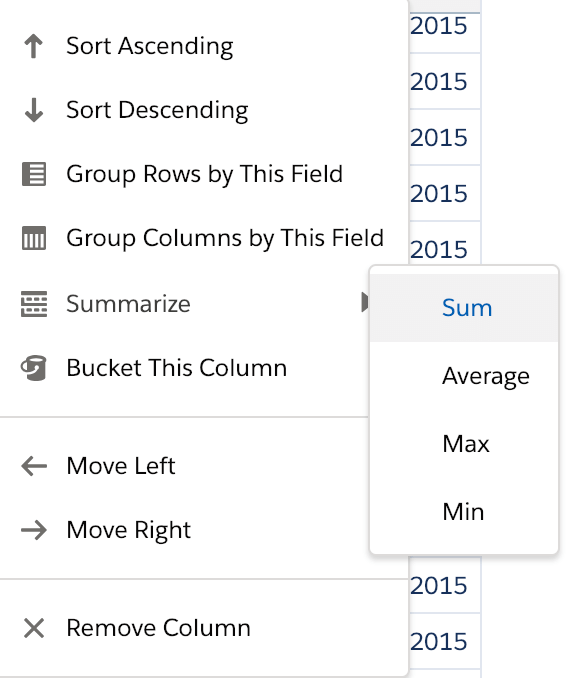 To add a summary field, click the down arrow next to the Amount column heading and select Summarize, followed by Sum. Click Save & Run, then complete the Save Report details by entering a Report Name, Report Unique Name and Report Description. Select a Folder to save your report in. Click Save. The report format will automatically change to Summary since you selected the groupings. 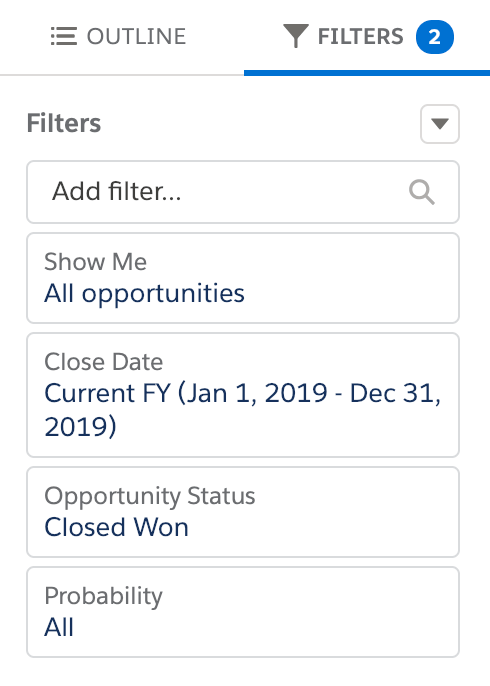 For this article, we'll be using the report criteria of Closed Won opportunities in the Last 30 Days grouped by Opportunity Owner. On the Salesforce report builder click on New Report and then select the Opportunities report type. To begin selecting the scope of the report using filters, update the opportunity status to Closed Won. Set the range to Last 30 days. To visualize your data you'll need to select the format and grouping for your report. In our example we want a list of all opportunities owned by our representatives, so we'll use the Summary report type and will group by the Opportunity Owner. To finish the report we'll Summarize the data based on the Amount of these opportunities. Click Save and run the report. Now that you have your report in the right format, you can display it in Geckoboard. Why doesn't my report return any data?